rollerski news - a nation of armchair biathletes? Is GB a nation of armchair biathletes? Mike Dixon recently let slip that the British audience for Eurosport's biathlon coverage is somewhere between 100,000 and 300,000. This makes it the channel's most popular winter sport, with an audience share many terrestrial channels would envy. It's hard not to be captivated by the sport - whether or not you have any interest in actually taking part. 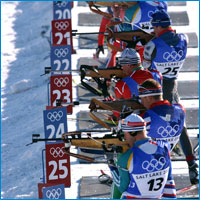 The format of biathlon (cross-country skiing and shooting), where all can be won or lost with one missed shot, makes it addictive viewing, and the insights and banter of the show's presenters all add to the excitement. Cross-country skiing, with arguably the more impressive athletic specimens, lags far behind its sister sport in viewer numbers. And yet, with all this interest in the TV coverage, why aren't there kids (and adults) queueing up to get involved? 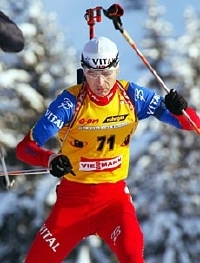 It's relatively easy to pick up the basics of skate skiing on rollerskis, and biathlon clubs offer courses on shooting. So why haven't things taken off? A case in point is Wessex club member Barbara Baker. Having watched the Eurosport coverage at home, last year she decided to make the 2007 British Biathlon Championships her goal. Although she'd had a go at 'classic' cross-country skiing on holiday, she'd never tried the 'skating' technique used in biathlon. At the end of March 2006 she took up skating rollerskiing for the first time, and with a good deal of training, support from the club, and using up her leave to have 3 weeks training on snow, she arrived in Ruhpolding in January 2007. Although a little daunted to be surrounded by army racers (who make up the bulk of British biathletes), she put in respectable performances, finishing 25th out of 28 in the 12.5k ladies' race (despite a good few missed shots). She did even better in the skating cross-country ski race at the championships, finishing 26th out of 47. (See BBU website for results). The point is, despite not having a huge amount of time on snow, it's possible to train hard in the UK, and compete against the best in the country without looking at all foolish. The fact that Barbara managed to beat army athletes - the majority of whom had almost 3 months on snow for her 3 weeks - shows the sport is a relatively open to anyone prepared to train hard. In fact in some ways, there has never been a better time to pit yourself against army skiers. Cross-country skiing and biathlon is the army's foremost adventure training activity - it is regarded as unrivalled in its ability to improve the teamwork, fitness, leadership and resourcefulness of the teams of soldiers who go and train for the season. And so - as an adventure training activity - biathlon has a great foundation within the army. As a sport, however, it has suffered a decline in recent years, which makes the non-military contribution to the sport all the more vital. Operational commitments, and a lack of time and interest, mean that the army teams are rarely seen at UK rollerski races in the summer, which they dominated 20 years ago. The teams train as hard as anyone for their 3 months on snow, but who knows what they're doing over the summer. Although the Wessex Club offers access to the sport to many living in England, it's the Scottish clubs which have the edge in developing youth talent. The excellent work done by supportive parents and friends, and guided by experienced athletes such as Mike Dixon and others, has seen the sports of cross-country skiing / biathlon take off in the local communities of Huntly and Aviemore. The results of these clubs are beginning to be seen (in cross-country skiing more than biathlon) and the structures of these clubs offer a model for others across the country. Can these clubs be replicated across the country? Of course, but not without individual vision and efforts. The UK has hundreds of ex-army biathletes, trained to a high degree, with months of experience training and racing to their name, on snow and rollerskis. If they had the desire and support it would not be difficult to set up local clubs. 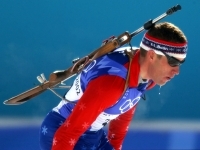 Mike Dixon remains the first and only such character to have brought biathlon back into the non-military world, and provides a great example. He told me recently that, in terms of technique, all you need to do is to get one of the 'cooler' older kids skiing well, and the rest will copy. Competitve instincts kick in, and the coaches' main job becomes structuring the training, and holding the kids back to make sure they don't overtrain. Adult clubs such as the Wessex club can also flourish, but they need members to come forward and get involved. The network of cross-country ski clubs and instructors (such as ourselves) can teach people to ski (especially those based around London, Manchester and the Lake District), and they can tap into the Wessex club for biathlon shooting training. So will the TV appeal of biathlon be translated into biathletes on the ground? The structures are there to make it happen, but potential athletes need to come forward and put in the training. If they did, they'd be amazed how much they would get out of this 'ulitmate' sport - but as with everything in life, it takes action to turn dreams into a reality.